Should You Consider Adding a Dash Cam to Your Car or Truck? Dashboard cameras, or “dash cams,” used to exist only in law enforcement vehicles. As the technology has improved and the devices have become less costly, more and more drivers have concluded that the devices could provide useful protection in the event of an auto accident. Read on to learn about how dash cams work, and why a dash cam might be a useful addition to your vehicle. Dash cams are installed on either the windshield, dashboard, or rear-view mirror of the vehicle to record the view from the front of the car. Some models also offer a rear-facing camera, providing both security and a backup assist feature. 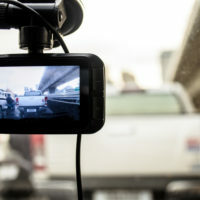 Many dash cams also offer drivers the ability to record video and audio from inside the vehicle, and some can even provide a 360˚ view in and around the car. The cameras come in a range of costs, with the cheapest costing under $100, and the highest-end models coming in at $250. Many require professional installation. When you’re in a serious accident involving a substantial claim for damages, your insurer may challenge your claim if there is a dispute over how the crash occurred or whether you’re to blame for the crash. This is especially true if the accident was a hit-and-run. A dash cam can provide insurers and courts with an objective account of how an accident happened and who is responsible. If another driver hits you and flees the scene of an accident, dash cams can be useful even if they don’t record the collision itself. The footage will likely prove that the collision was not a solo crash, and drivers with dash cams that have an audio recording feature can dictate the make, model, and license plate number of the vehicle. The cameras can even provide personal security to drivers who are parked in an isolated section of a parking lot, recording the identity of anyone who approaches the vehicle. If you or someone you love has been injured in an Indiana motor vehicle accident, find out if you should file a claim for money damages for your lost wages, medical expenses, or pain and suffering by contacting the experienced and effective Indianapolis personal injury lawyers at Lee Cossell & Crowley, LLP for a consultation on your case, at 317-631-5151.